The Fujitsu F1 cleaner alternative we show in this article is a good solution to replace the F1 cleaner, F2 Cleaner, the F1 impregnated Cleaning Wipes and in general the Fujitsu Scanner Cleaning Kit. The F1 cleaner is a liquid solution sold by the manufacturer to clean the interior of the scanners. It can also be a part of the Fujitsu Scanner Cleaning Kit or sold separately. Fujitsu claims that the F1 cleaner, together with the Fujitsu cleaning Kit is the best choice to clean scanners. While this may be possible, we will show you the best Fujitsu cleaner F1 alternative. We will also provide you with other products to use to clean different parts, from plastics to the glass of the scanner. Our kit to clean your scanner will help you achieve good results. In this paragraph, we will take each part of the scanner that needs cleaning and we will supply you with an alternative to the Fujitsu product. We will look at basic parts, such as plastics, glass and rubber rollers. At the same time, we will give you some tips on further materials which may be helpful. To clean the pad assemblies and pick roller, we always like a solution that will regenerate the rubber. Isopropyl alcohol solutions might seem like a logical choice, but please avoid them. They will just dry the rubber and with constant friction with the paper, it will reduce the roller life to 50%. For this, we would definitely choose the Rubber Roller Cleaner for Martin Yale Folders. Martin Yale has been a name involved in paper finishing machines. Such machines process all kinds of paper material. They also process cardboard material. All their machines use rubber rollers. If they use a certain product to clean rollers I would definitely choose it. There are also other generic products such as the Max Professional 2145 Rubber Rejuvenator – 10 oz. While this product might be just as good as the Martin Yale Roller Cleaner, I wouldn’t want to test it if I know something that works already. The price difference just doesn’t make sense for a test. For cleaning glass and plastics we always recommend something with at least some antistatic characteristics. The Sprayway Glass Cleaner is great for this. It is not abrasive to scratch and it does not polish the scanning glass. But at the same time, it will clean the glass as required. We also recommend you use this product as a pathway cleaner, but only after you have vacuumed that path. Because a lot of paper is going through the scanner, you will have a lot of dust and paper particles clogging up. Vacuum first clean later. You can also use window cleaners but you never know what those might contain. Generally, it shouldn’t be a problem, but the Sprayway Glass Cleaner is cheap enough to buy it. In regards to the cleaning cloth, we can recommend different ones for scanner glass and for rollers. For rollers, we would not recommend a very expensive one. Better yet, we would recommend you wash the ones you used for the glass and use them for the rollers. Always keep separate cloths for glass and rollers. For rubber rollers and for plastics you can use the 50 Pack – SimpleHouseware Microfiber Cleaning Cloth. This 50 pack is large enough to last for a while. I personally suggest you use separate ones for rubber and plastics. The ones you use for rubber you can clean using the washing machine. Same for plastics. But just use separate cloths them. For glass surfaces, you will need a higher quality microfiber cloth. I would recommend the MR.SIGA Ultra Fine Microfiber Cloths, 12 PACK. There are many enough to last for a while if you only use them for the glass surface. Don’t mix them up with the cloths you use for rubber and plastics. Keep them separated. The cloth for glass surfaces should be used for glass surfaces only. The other cloth should be used for rubber and plastics only. Otherwise, you will move the dirt and lint from the rollers onto the glass surface. With our solution, you will be able to easily clean any Fujitsu Scanners. For example, you won’t need a Scansnap ix500 cleaning kit or Fujitsu f1 cleaning wipes. No more need for Fujitsu scanner cleaning sheets. Cleaning a Scasnap s1500, for example, will be the same as cleaning an HP scanner. The Fujitsu Scanner cleaning wipes are not a specially designed product. 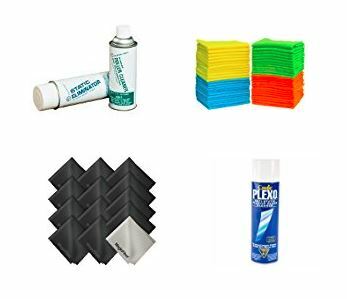 They are just a generic product that does the same thing as the MagicFiber Microfiber Cleaning Cloths with the Castle Plexo Anti-Static Glass Cleaner or the Sprayway Glass cleaner. You can clean Kodak, Canon and even Panasonic scanners or consumables. In addition, we suggest you try them out for printing machines. For any equipment with rubber feed rollers, they will work just fine. If you do want to buy a new document scanner, we have a review of the Fujitsu FI 7160. The review applies to other Fujitsu scanners also, as they all use the PaperStream IP drive. If you want to store documents after scanning, head to our article on best archival boxes. With this in mind, we hope you will use our Fujitsu F1 cleaner alternative and it proves to be a good solution for you.